Xander Jeanneret is a reality personality, actor, and YouTube producer. You may recognize him from Seasons 2 and 3 of the hit TBS show KING OF THE NERDS, where he was a fan-favorite contestant and invited back as the host of Behind the Scenes content. Xander also produced and starred in the youtube series Under The Table, which garnered over 100,000 views in a short amount of time. He also created and starred in the series Super Anime Smackdown, an Anime-based debate show with G4's Courtney Kraft. Xander also performs and writes for the nerd parody band Library Bards with Bonnie Gordon (ABC's The Quest) and performs with the fantasy theatre troupe Dungeon Master, which has been producing shows for over 30 years. 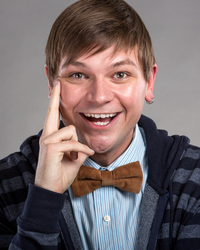 A representative of the LGBTQ community, Xander also works with World of Wonder (the production company behind RuPaul's Drag Race) to produce dynamic online content. Xander has spoken at over 30 conventions in 2014 on equality in Nerd Media, including San Diego Comic Con, New York Comic Con, and Los Angeles Pride. You can hear Xander's voice in the hit indie fighting game Divekick (as The Announcer) and the MMORPG Dragon Nest. Xander is fluent in Japanese and provides a unique experience when giving talks about living and going to University in Japan. You can catch Xander as a host all over the internet, including appearances on The Young Turks Network's "NerdAlert", AfterBuzz TV, and on his personal YouTube channel Xandervlogs.